The field of neural computation, started more than half a century ago, has known its ups and downs, but since 2012, it exhibits an unprecedented boom, triggered by the dramatic breakthrough in the development of deep neural networks. As a result, such networks have already started to be broadly used for image and speech recognition, language understanding and translation, vehicle navigation, and many other applications. All this rapid progress in the field of Artificial Intelligence (known as the fourth industrial revolution) hinges on the use of hardware more efficient than the standard CPUs or even GPUs. However, the performance and efficiency of these digital systems are still insufficient for more ambitious tasks which prevents real AI capabilities to be deployed at the edge. The main reasons behind this efficiency gap are (i) using Von Neumann architectures with separate memory and processing units and (ii) the fact that the usage of digital operations for mimicking imprecise biological neural networks is inherently unnatural. In the first part of my talk, I will focus on explaining how the approximate computation done in mixed-signal integrated circuits through the process called in-memory computation, which utilize nanoscale non-volatile memory devices like memristors and flash transistors, can beat digital implementations by two to three orders of magnitude in terms of speed and power efficiency in some specific applications. The secret sauce behind this dramatic efficiency improvement is that the key operation performed by any neural network, i.e. the vector-by-matrix multiplication (VMM), can be implemented in arrays of non-volatile memory devices using the fundamental Ohm’s and Kirchhoff’s laws. In the second part, I discuss the possibilities and opportunities connected to using even more unconventional but advanced technologies like nonlinear or 3D memory arrays to scale up these beyond CMOS architectures to larger, deeper and more powerful networks where the accuracy of computation, chip area and the power consumption are the main challenges. Farnood Merrikh Bayat is now a CTO and Co-founder of Mentium Technologies Inc., a semiconductor startup dedicated to developing alternative computing solutions for AI applications. Prior to that, he has served as a postdoctoral fellow in the department of Electrical and Computer Engineering at the University of California Santa Barbara for about two years working on the designing, fabrication and testing of non-Von Neumann neuromorphic hardware using emerging memory device technologies. His current research interests include mixed-signal, bio-inspired, approximate and in-memory computation of data and memory intensive applications and algorithms, neuromorphic computing, and novel electronic devices and high-performance circuit architectures with the possibility of expansion to 3D structures. He received his B.Sc. degree in Electrical Engineering from the K.N. Toosi University of Technology, Iran, in 2006, and the M.Sc. and his first Ph.D. degrees in Electrical Engineering from the Sharif University of Technology, Iran, in 2008 and 2012, respectively. In 2012, he joined the Electrical and Computer Engineering Department of the University of California Santa Barbara, to pursue his second Ph.D. in Computer Engineering, from which he graduated in April 2015. His research has been chronicled in over 50 journal and refereed international conference papers including Nature, Nature Communications and Nature Electronics. 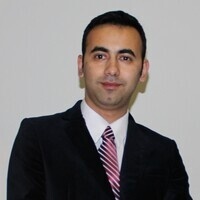 Dr. Merrikh Bayat has been recognized through many awards and honors including the UCSB’s Graduate Division Dissertation Fellowship (2014) and a Best Short Paper Award at IEEE/ACM International Symposium on Nanoscale Architectures (2013). He is a recipient of several U.S. patents, more than a million-dollar grants from federal agencies, and has served as a reviewer for numerous scientific journals and conferences.